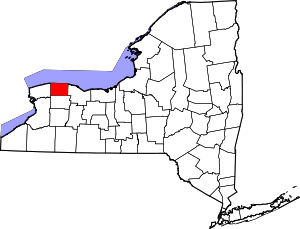 This is intended to be a complete list of properties and districts listed on the National Register of Historic Places in Orleans County, New York. The locations of National Register properties and districts (at least for all showing latitude and longitude coordinates below) may be seen in a map by clicking on "Map of all coordinates". [note 1] Two listings, the New York State Barge Canal and the Cobblestone Historic District, are further designated a National Historic Landmark. There are currently 27 listings in the county, the fourth fewest in the state after Schuyler County (19), Hamilton County (22) and Genesee County (23). Seven of the listings are historic districts, including Mount Albion Cemetery (Millville Cemetery is classified as a site). The remaining 20 are individual buildings. No structures in the county are yet listed on the National Register. Of the 20 buildings, at least 10 have been used as dwellings at some point in their history. Two[note 2] of those were originally inns that have since become residences. The Tousley-Church House was later converted into the local Daughters of the American Revolution chapter offices. The four conventional historic districts[note 3] all include some residential properties as well among their contributing properties. Three other buildings—the Albion and Medina post offices and the Medina Armory—are government buildings. The armory is now used by the local YMCA. No commercial buildings in Orleans County are individually listed on the Register. Nor are any religious buildings, although seven churches contribute to the Orleans County Courthouse Historic District. Similarly, no educational buildings have been listed on their own; the Cobblestone Historic District includes an old one-room schoolhouse among its contributing properties. In the five districts, there are 135 buildings on 104 acres (42 ha). Most of that acreage is accounted for by Mt. Albion Cemetery, the largest listing in the county at 70 acres (28 ha). The Cobblestone Historic District, with three buildings on two discontiguous plots totaling three-quarters of an acre (3,000 m²), is the smallest district and the smallest National Historic Landmark District in New York. The other three districts are in the downtowns of Medina and Albion, the largest settlements in the county. The two Albion districts abut each other, with the southerly being characterized by the public buildings, churches and residences around the county courthouse while the northerly is primarily commercial. Medina's Main Street Historic District is almost all commercial property. All but three of the buildings (and one structure[note 4]) within the historic districts are considered contributing properties. None of the contributing properties are themselves listed individually on the Register. However, the Albion post office, within the bounds of the county courthouse historic district, is not considered a contributing property to it despite later being listed on the Register, since it was built two decades after the district's period of significance. (#83001757) 223 S. Clinton St.
43°14′22″N 78°11′47″W﻿ / ﻿43.239444°N 78.196389°W﻿ / 43.239444; -78.196389﻿ (William V. N. Barlow House) Albion Barlow, architect of many important buildings in downtown Albion, including the county courthouse, built this eclectic home for himself in 1875. Its rear yard has one of the village's few remaining hand-pumped wells. (#05000635) 142 S. Main St.
43°19′00″N 78°23′22″W﻿ / ﻿43.316775°N 78.389383°W﻿ / 43.316775; -78.389383﻿ (Jackson Blood Cobblestone House) Lyndonville The Blood family is supposed to have built this sophisticated 1846 Greek Revival cobblestone house by hauling the stones down from Lake Ontario themselves. (#14001216) 3717 N. Gravel Rd. (#10000044) 4690 Bennetts Corners Rd. 43°11′19″N 78°01′02″W﻿ / ﻿43.188611°N 78.017222°W﻿ / 43.188611; -78.017222﻿ (Butterfield Cobblestone House) Clarendon This 1849 Greek Revival cobblestone house is the only such structure in Clarendon. It is considered the finest building in that style in county. (#12000258) 16301 E. Lee Rd. 43°11′38″N 78°03′53″W﻿ / ﻿43.1938°N 78.0647°W﻿ / 43.1938; -78.0647﻿ (Clarendon Stone Store) Clarendon General store, an early use of Medina sandstone. Also known as the "Old Stone Store", or the "Copeland Store". 43°17′13″N 78°11′24″W﻿ / ﻿43.286944°N 78.19°W﻿ / 43.286944; -78.19﻿ (Cobblestone Historic District) Childs Orleans County's only National Historic Landmark, and the state's smallest NHL district, consists of three 19th-century cobblestone buildings reflecting style at its highest in different periods. They include the state's oldest known cobblestone church and its parsonage, as well as one of only two buildings with cobblestone veneer over wood frame. (#100001070) 3286 Gaines Basin Rd. (#09000378) 13079 W. Lee Rd. 43°12′10″N 78°16′43″W﻿ / ﻿43.202778°N 78.278611°W﻿ / 43.202778; -78.278611﻿ (Benjamin Franklin Gates House) Barre Gates, a pioneering settler of Barre, built this Greek Revival stacked-plank house and the region's first tannery around 1830. New owners restored it in the early 21st century; it is still a working farm. (#13000450) NY 237 & S. Holley Rd. (#15000539) 1 Village Sq., 3-35 Frisbe Terrace, Public Sq., 32-34 Albion, 1-13 S. Main, 1 Wright, 2 White, 1 & 4-18 Thomas Sts. 43°13′33″N 78°01′36″W﻿ / ﻿43.225767°N 78.0266787°W﻿ / 43.225767; -78.0266787﻿ (Holley Village Historic District) Holley Commercial and institutional core of a village as it developed over a century following a distinctive street plan along the Erie Canal. (#95000213) Roughly, along Main and Center Sts., West Ave. and Proctor Pl. 43°13′13″N 78°23′13″W﻿ / ﻿43.220278°N 78.386944°W﻿ / 43.220278; -78.386944﻿ (Main Street Historic District) Medina When Medina came into existence following the construction of the Erie Canal, this strip from the canal to the railroad tracks was the first area of the village. Its buildings, from the 1830s to the 1940s, are relics of Medina's industrial peak years. The district was later expanded slightly to include the Medina Railroad Museum building. 43°13′19″N 78°23′32″W﻿ / ﻿43.221944°N 78.392222°W﻿ / 43.221944; -78.392222﻿ (Medina Armory) Medina This structure, built of locally quarried Medina sandstone, was George Heins' first commission as state architect in 1901. It is today the Lake Plains YMCA. 43°11′23″N 78°19′28″W﻿ / ﻿43.189722°N 78.324444°W﻿ / 43.189722; -78.324444﻿ (Millville Cemetery) Millville This exemplary 1871 rural cemetery on a small hill, expanded from earlier burying ground, is the final resting place of many residents of this former bustling agricultural hamlet. 43°14′22″N 78°09′20″W﻿ / ﻿43.239444°N 78.155556°W﻿ / 43.239444; -78.155556﻿ (Mt. Albion Cemetery) Town of Albion This rural cemetery was built in 1842 on a high drumlin outside of Albion. It features local Civil War monument and chapel. Among those buried here are many local politicians of the 19th century, and former Georgia governor Rufus Bullock. 43°14′56″N 78°11′27″W﻿ / ﻿43.248815°N 78.190914°W﻿ / 43.248815; -78.190914﻿ (New York State Barge Canal) Albion, Gaines, Holley, Medina, Murray, Ridgeway, Shelby Successor to Erie Canal approved by state voters in early 20th century to compete with railroads. (#94001341) Roughly, along N. Main, E. Bank, W. Bank and Liberty Sts. 43°14′51″N 78°11′37″W﻿ / ﻿43.2475°N 78.193611°W﻿ / 43.2475; -78.193611﻿ (North Main-Bank Streets Historic District) Albion The northerly of Albion's two downtown historic districts is one of the most intact commercial areas along the Erie Canal, with buildings from the century after its completion. 43°14′45″N 78°11′36″W﻿ / ﻿43.245833°N 78.193333°W﻿ / 43.245833; -78.193333﻿ (Orleans County Courthouse Historic District) Albion The southern downtown Albion historic district is the civic and religious center of the village and county. Centered around William Barlow's 1858 county courthouse are residential, commercial and institutional buildings, including seven churches. Many use Medina sandstone. (#12000259) 320 N. Main St.
43°13′21″N 78°23′16″W﻿ / ﻿43.22259°N 78.38786°W﻿ / 43.22259; -78.38786﻿ (Payjack Chevrolet Building) Medina 1949 concrete building is intact example of car dealership facility built to General Motors international standards of that era. 43°13′00″N 78°25′51″W﻿ / ﻿43.216667°N 78.430833°W﻿ / 43.216667; -78.430833﻿ (Servoss House) Ridgeway A former canal worker built this early 1830s Greek Revival house alongside the canal using an unusual horizontal-plank structural system. (#08001079) 10181 West Shelby Rd. (#04000291) 4652 Oak Orchard Rd. 43°11′11″N 78°11′40″W﻿ / ﻿43.186389°N 78.194444°W﻿ / 43.186389; -78.194444﻿ (Skinner-Tinkham House) Barre Center This 1829 Federal-style tavern along a busy highway, later remodeled into house, is one of the county's few surviving brick buildings in that style. Restoration efforts are underway after several decades of neglect. (#01001565) 249 N. Main St.
43°15′08″N 78°11′34″W﻿ / ﻿43.252222°N 78.192778°W﻿ / 43.252222; -78.192778﻿ (Tousley-Church House) Albion This 1840 Greek Revival house was expanded ten years later in a fashion showing strong influence of Minard Lafever. Since being renovated in the 1930s it has housed the local Daughters of the American Revolution chapter. (#88002450) 8 S. Main St.
43°14′46″N 78°11′39″W﻿ / ﻿43.246°N 78.194083°W﻿ / 43.246; -78.194083﻿ (US Post Office-Albion) Albion This 1937 post office uses one of more popular Colonial Revival designs for post offices in the state. It is within the Orleans County Courthouse Historic District, but not considered a contributing property to that listing since it was built after 1910. (#88002351) 128 W. Center St.
43°13′14″N 78°23′19″W﻿ / ﻿43.220556°N 78.388611°W﻿ / 43.220556; -78.388611﻿ (US Post Office-Medina) Medina The only other known reuse of this sophisticated 1931 Colonial Revival design is in Salem, Indiana. Wikimedia Commons has media related to National Register of Historic Places in Orleans County, New York. ^ Excluding Mt. Albion Cemetery. ^ A small park within the North Main-Bank Streets Historic District in Albion, built on the site of a building that burned. ^ a b c Robert T. Englert (July 2001). "National Register of Historic Places Registration: Tousley-Church House". New York State Office of Parks, Recreation and Historic Preservation. Archived from the original on 2011-12-10. Retrieved 2009-06-14. See also: "Accompanying 24 photos". ^ a b c C. Wilson Lettin (February 1979). "National Register of Historic Places Registration: Orleans County Courthouse Historic District". New York State Office of Parks, Recreation and Historic Preservation. Archived from the original on 2011-08-09. Retrieved 2009-06-14. See also: "Accompanying six photos". ^ a b Claire L. Ross (July 1983). "National Register of Historic Places Registration: Barlow, William V. N., House". New York State Office of Parks, Recreation and Historic Preservation. Archived from the original on 2011-12-10. Retrieved 2009-06-14. See also: "Accompanying nine photos". Archived from the original on 2011-12-10. ^ a b Robert T. Englert (February 2005). "National Register of Historic Places Registration: Blood, Jackson, Cobblestone House". New York State Office of Parks, Recreation and Historic Preservation. Archived from the original on 2011-12-10. Retrieved 2009-06-14. See also: "Accompanying 10 photos". Archived from the original on 2011-12-10. ^ a b Robert T. Englert (July 2009). "National Register of Historic Places Registration: Butterfield Cobblestone House". New York State Office of Parks, Recreation and Historic Preservation. Archived from the original on 2011-08-10. Retrieved 2010-06-15. See also: "Accompanying photos". Archived from the original on 2011-08-10. ^ a b Robert T. Englert (December 2006). "National Register of Historic Places Registration: Cobblestone Inn". New York State Office of Parks, Recreation and Historic Preservation. Archived from the original on 2011-12-10. Retrieved 2009-06-14. See also: "Accompanying four photos". Archived from the original on 2011-12-10. ^ a b Robert T. Englert (June 2008). "National Register of Historic Places Registration: Benjamin Franklin Gates House". New York State Office of Parks, Recreation and Historic Preservation. Archived from the original on 2011-12-10. Retrieved 2010-11-09. See also: "Accompanying six photos". Archived from the original on 2011-12-10. ^ a b Nancy L. Todd (January 1995). "National Register of Historic Places Registration: Main Street Historic District". New York State Office of Parks, Recreation and Historic Preservation. Archived from the original on 2011-08-09. Retrieved 2009-06-14. See also: "Accompanying 21 photos". Archived from the original on 2011-12-10. ^ Elizabeth A. Bakker Johnson (September 1997). "National Register of Historic Places Registration: Main Street Historic District Boundary Increase". New York State Office of Parks, Recreation and Historic Preservation. Archived from the original on 2011-12-10. Retrieved 2009-06-14. See also: "Accompanying five photos". Archived from the original on 2011-12-10. ^ a b Nancy L. Todd (March 1995). "National Register of Historic Places Registration: Medina Armory". New York State Office of Parks, Recreation and Historic Preservation. Archived from the original on 2011-12-10. Retrieved 2009-06-14. See also: "Accompanying eight photos". Archived from the original on 2011-12-10. ^ a b Robert T. Englert (January 2007). "National Register of Historic Places Registration: Millville Cemetery". New York State Office of Parks, Recreation and Historic Preservation. Archived from the original on 2011-12-10. Retrieved 2009-06-14. See also: "Accompanying eight photos". Archived from the original on 2011-12-10. ^ a b C. E. Brooke (June 1976). "National Register of Historic Places Registration: Mt. Albion Cemetery". New York State Office of Parks, Recreation and Historic Preservation. Archived from the original on 2011-12-10. Retrieved 2009-06-14. See also: "Accompanying seven photos". Archived from the original on 2011-12-10. ^ a b Nancy L. Todd (September 1994). "National Register of Historic Places Registration: North Main-Bank Streets Historic District". New York State Office of Parks, Recreation and Historic Preservation. Archived from the original on 2011-12-10. Retrieved 2009-06-14. See also: "Accompanying eleven photos". Archived from the original on 2011-08-10. ^ a b Daniel McEneny (n.d.). "National Register of Historic Places Registration: Servoss House". New York State Office of Parks, Recreation and Historic Preservation. Archived from the original on 2011-08-10. Retrieved 2009-06-14. See also: "Accompanying six photos". Archived from the original on 2011-12-10. ^ a b Robert T. Englert (June 2008). "National Register of Historic Places Registration: Shelp, John, Cobblestone House". New York State Office of Parks, Recreation and Historic Preservation. Archived from the original on 2011-12-10. Retrieved 2009-06-14. See also: "Accompanying seven photos". Archived from the original on 2011-12-10. ^ a b Robert T. Englert (June 2002). "National Register of Historic Places Registration: Skinner-Tinkham House". New York State Office of Parks, Recreation and Historic Preservation. Archived from the original on 2011-08-09. Retrieved 2009-06-14. See also: "Accompanying six photos". Archived from the original on 2011-12-10. ^ Larry E. Gobrecht (July 1986). "National Register of Historic Places Registration: United States Post Office, Albion, Orleans County / Albion Post Office". New York State Office of Parks, Recreation and Historic Preservation. Archived from the original on 2011-12-10. Retrieved 2009-06-14. See also: "Accompanying five photos". Archived from the original on 2011-12-10. ^ a b Larry E. Gobrecht (December 1986). "National Register of Historic Places Registration: United States Post Office, Medina, New York / Medina Post Office". New York State Office of Parks, Recreation and Historic Preservation. Archived from the original on 2011-08-09. Retrieved 2009-06-14. See also: "Accompanying seven photos". Archived from the original on 2011-12-10. This page was last edited on 19 April 2018, at 22:26 (UTC).